The redback spider (Latrodectus hasselti) belongs to the family Theridiidae, the comb-footed spiders. Its genus Latrodectus also includes black widows, whose name may be more familiar to North American readers. The redback spider can be found throughout Australia, although it is more commonly seen in the temperate regions than in the colder, southern areas. The spider exists in higher numbers in Australia's urban and suburban areas and is virtually absent in the continent's forests. Outside of Australia, similar species of Latrodectus include Karakurt in Central Asia, Malmignatte in Europe, the Koppie spider in South Africa, and the Night Stinger in New Zealand. The redback spider bite is the most common envenomation treated with antivenom in Australia. The female redback spider is responsible for most envenomations. She is usually 10 mm in length and has a small cephalothorax and a large, globular abdomen that bears a red, orange, or brown stripe. The male redback spider is considerably smaller than the female and is only occasionally able to cause mild envenomation. [1, 2] See the images below. Female redback spider showing a distinctive red stripe over the abdomen. Image courtesy of John Paterson. 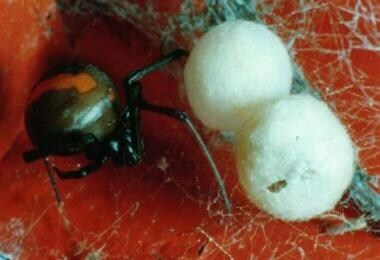 Female redback spider with egg sacs. Image courtesy of John Paterson. See Venomous Spider Bites: Keys to Diagnosis and Treatment, a Critical Images slideshow, for help identifying and treating various envenomations. 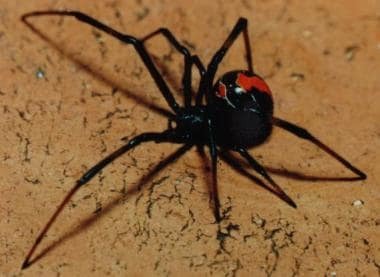 The redback spider can cause a clinical condition referred to as latrodectism following a bite. The active ingredient in the redback's venom responsible for its toxic properties in vertebrates is a 130-kd protein, alpha-latrotoxin (aLTX). aLTX is a potent neurotoxin that works in 2 ways to produce efflux of neurotoxins from presynaptic nerve cells. In one mechanism of action, aLTX aggregates into tetramers that form pores in neuronal presynaptic cell membranes allowing calcium influx into the cytosol and resulting in exocytosis of neurotransmitters such as norepinephrine, dopamine, acetylcholine, glutamate, and GABA. The membrane pores formed by aLTX may also be large enough for a direct efflux of small intracellular compounds that are vital for cytoplasm function. Only the black widow spider, a close relative of the redback spider, lives in the United States. These arachnids cause approximately 2500 envenomations each year. The redback spider is found in Australia, New Zealand, and southern Asia. In Australia, the spider has been blamed for 250 envenomations requiring antivenom annually. Perhaps many more cases are mild or unrecognized and do not receive antivenom. The web site Museum Victoria contains additional information about and photographs of the redback spider. White J. CSL Antivenom Handbook. 2nd ed. 2001. Available at http://www.toxinology.com/generic_static_files/cslb_index.html. Nimorakiotakis B, Winkel KD. Spider bite--the redback spider and its relatives. Aust Fam Physician. 2004 Mar. 33(3):153-7. [Medline]. [Full Text]. Graudins A. Widow spider envenomation: Lactrodectism. Dart RC, ed. Medical Toxicology. 3rd ed. Lippincott Williams & Wilkins; 2003. 1592-1595/248. [Full Text]. Nicholson GM, Graudins A. Spiders of medical importance in the Asia-Pacific: atracotoxin, latrotoxin and related spider neurotoxins. Clin Exp Pharmacol Physiol. 2002 Sep. 29(9):785-94. [Medline]. Ushkaryov YA, Volynski KE, Ashton AC. The multiple actions of black widow spider toxins and their selective use in neurosecretion studies. Toxicon. 2004 Apr. 43(5):527-42. [Medline]. Mollison L, Liew D, McDermott R, Hatch F. Red-back spider envenomation in the red centre of Australia. Med J Aust. 1994 Dec 5-19. 161(11-12):701, 704-5. [Medline]. Isbister GK, Gray MR. Latrodectism: a prospective cohort study of bites by formally identified redback spiders. Med J Aust. 2003 Oct 20. 179(8):455; author 455-6. [Medline]. Australian Museum. Available at http://australianmuseum.net.au/Redback-Spiders. Sutherland SK, Trinca JC. Survey of 2144 cases of red-back spider bites: Australia and New Zealand, 1963--1976. Med J Aust. 1978 Dec 30. 2(14):620-3. [Medline]. Bush SP. Black widow spider envenomation mimicking cholecystitis. Am J Emerg Med. 1999 May. 17(3):315. [Medline]. Ward TR, Falconer JA, Craven JA. An irritable infant and the runaway redback: an instructive case. Case Rep Emerg Med. 2011. 2011:125740. [Medline]. [Full Text]. Dzelalija B, Medic A. Latrodectus bites in northern Dalmatia, Croatia: clinical, laboratory, epidemiological, and therapeutical aspects. Croat Med J. 2003 Apr. 44(2):135-8. [Medline]. White J. Envenoming and antivenom use in Australia. Toxicon. 1998 Nov. 36(11):1483-92. [Medline]. Dart RC, Bogdan G, Heard K, et al. A randomized, double-blind, placebo-controlled trial of a highly purified equine F(ab)2 antibody black widow spider antivenom. Ann Emerg Med. 2013 Apr. 61(4):458-67. [Medline]. Isbister GK, Page CB, Buckley NA, et al. Randomized Controlled Trial of Intravenous Antivenom Versus Placebo for Latrodectism: The Second Redback Antivenom Evaluation (RAVE-II) Study. Ann Emerg Med. 2014 Jul 3. [Medline]. Edmonds M. Redback Antivenom… what is everyone RAVEing on about?. Adelaide Emergency Physicians EDucation Resources. Available at http://adelaideemergencyphysicians.com/2014/07/redback-antivenom-what-is-everyone-raveing-on-about/. Accessed: August 18, 2014. Clark RF, Wethern-Kestner S, Vance MV, Gerkin R. Clinical presentation and treatment of black widow spider envenomation: a review of 163 cases. Ann Emerg Med. 1992 Jul. 21(7):782-7. [Medline]. Cohen J, Bush S. Case report: compartment syndrome after a suspected black widow spider bite. Ann Emerg Med. 2005 Apr. 45 (4):414-6. [Medline]. [Full Text]. Isbister GK. Failure of intramuscular antivenom in Red-back spider envenoming. Emerg Med (Fremantle). 2002 Dec. 14(4):436-9. [Medline]. Isbister GK, Brown SG, Miller M, Tankel A, Macdonald E, Stokes B, et al. A randomised controlled trial of intramuscular vs. intravenous antivenom for latrodectism--the RAVE study. QJM. 2008 Jul. 101(7):557-65. [Medline]. Hahn IH. Chapter 119: Arthropods. Flomenbaum NE, Goldfrank LR, Hoffman RS, Howland MA, Lewin NA, Nelson LS, eds. Goldfrank's Toxicologic Emergencies. 9th ed. New York, NY: McGraw-Hill; 2010. 1561-1581. Female redback spider. Image courtesy of John Paterson. The authors and editors of Medscape Reference gratefully acknowledge the contributions of previous authors, Alexandr Rafailov, MD, and Mark A Silverberg, MD, to the development and writing of this article. Pill ID: Which Drug Is This? Medication Emergencies: What Drug Is This? Fast Five Quiz: Do You Know the Signs of and Best Treatment for Alcohol Poisoning? Fast Five Quiz: How Much Do You Know About Holiday-related Dangers?